*Note: all of these prices are of course USD, and even if I don't mention it, the total prices from each purchase includes tax, which is 8.875% in the state of New York. Because I like organization (well, I'm a bullet journalist, so . 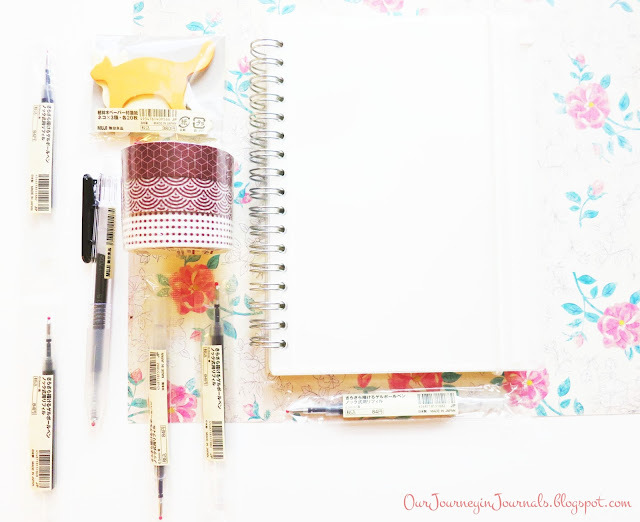 . .) I'm going to divide this post up by each day that I bought any stationery and then by each individual store. This is the first day that I was in New York City. I didn't actually go to any stores (I just went from the airport to my sister's apartment since I stayed with her), but she gifted me a few things. 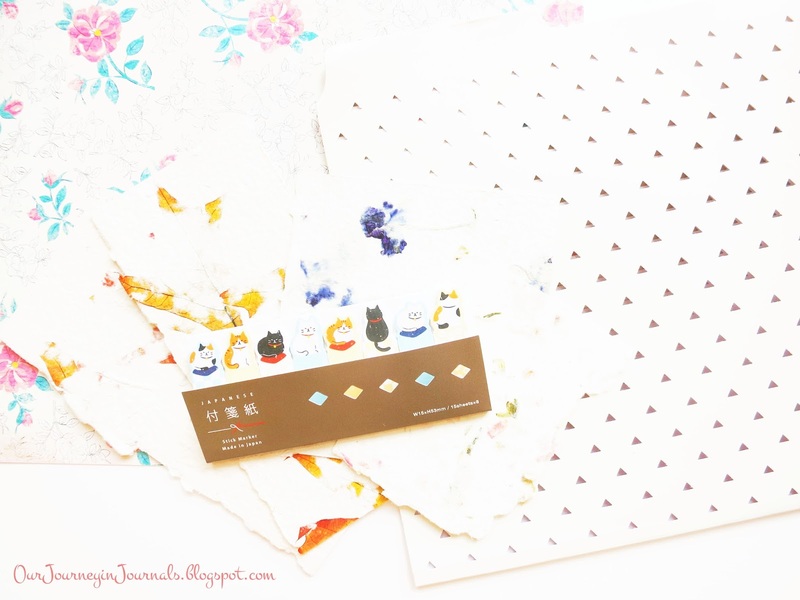 She gave me a few pieces of fancy paper pressed with flowers and leaves, with a folder to keep them in, and a pack of cat sticky flags from the Japanese stationery brand Mind Wave Inc. Along with getting two books - a fantasy novel and Big Magic by Elizabeth Gilbert - I also got a set of two rose gold foiled notebooks that are about A5 sized (just a tiny bit narrower and taller than true A5). They're lined and each have 96 pages. The set was $12.95 (about $14.10 with tax), and they were designed by Katharine Watson but published by Chronicle Books. They came in plastic packaging, so I didn't realize until I was writing this post and actually opening the set, but the top of the pages have a flower graphic at the center top of each time; it's the same flower design that's on the covers. 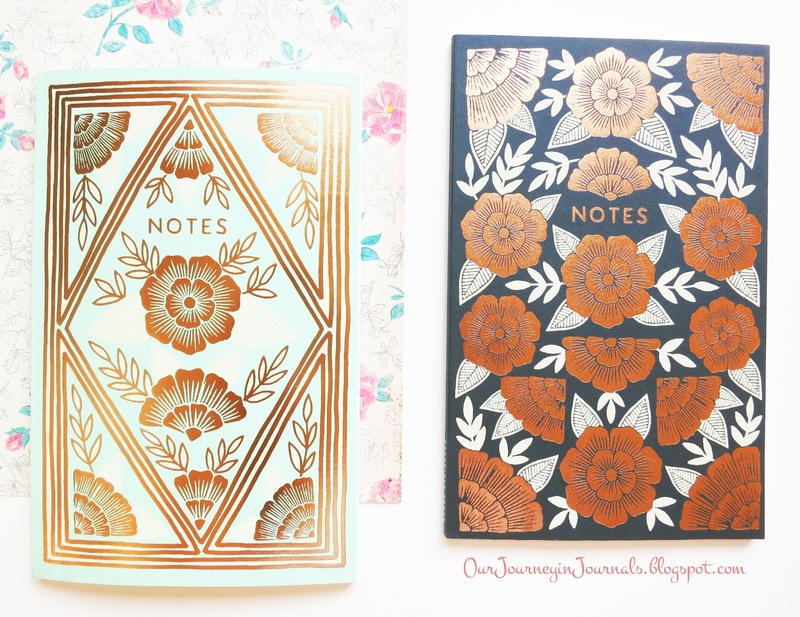 Also, the ruling is a little wider than I would like, but it's not a big deal, especially considering how fricking pretty these notebooks are! I actually first heard of this store from a haul video that Studyign did. 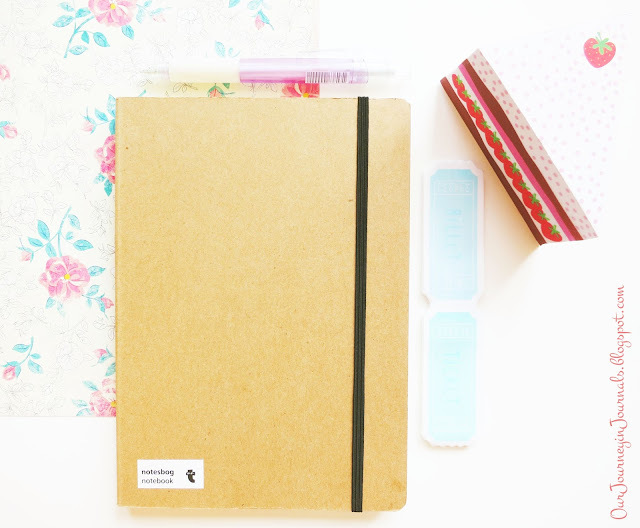 They sell a wide variety of stuff (kind of like Target but minus food), but they're known in the studyblr community for their stationery. I was actually a little disappointed by the selection they had since a big majority of it was super cutesy, brightly colored stuff - which is totally not my style. 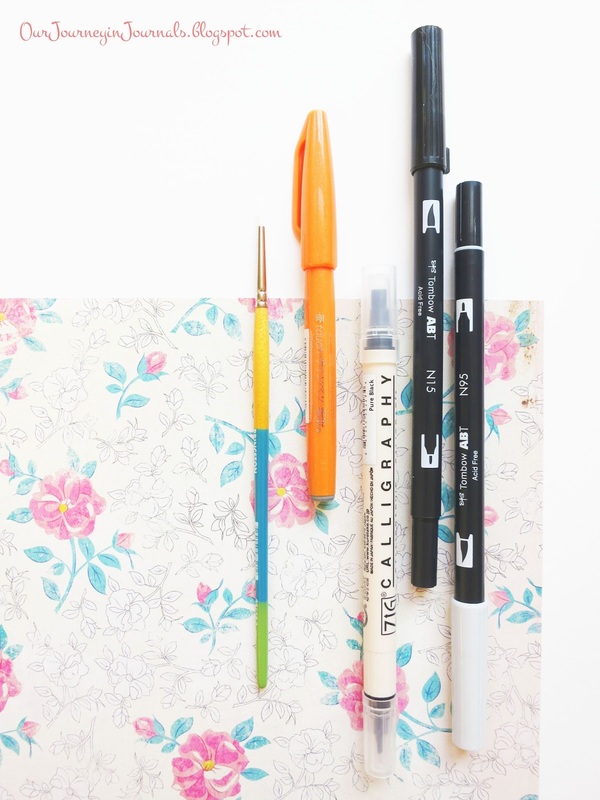 However, that's just my personal preference, and I still like how inexpensive their stationery is. In terms of the things I actually did get, I purchased an A5 kraft-colored sketchbook ($3), a pad of sticky notes that looks like a slice of strawberry cake ($4), a pack of sticky notes that looks like raffle tickets ($3), and a purple mechanical ($0.50) that I think has 0.5 mm graphite. In total, it was $10.50, or $11.43 with tax. I haven't actually tried any of this stuff yet, but I believe the paper of the sketchbook is off-white - think Rhodia Webnotebook color - and is 100 GSM. Kinokuniya is an Asian bookstore (more specifically Japaneese and Chinese), but they also carry English books. However, I didn't get any books; I was more focused on their lower level which is all stationery. Although it was primarily Japanese stationery, I also remember seeing some Rhodia and Leuchtturm products there. 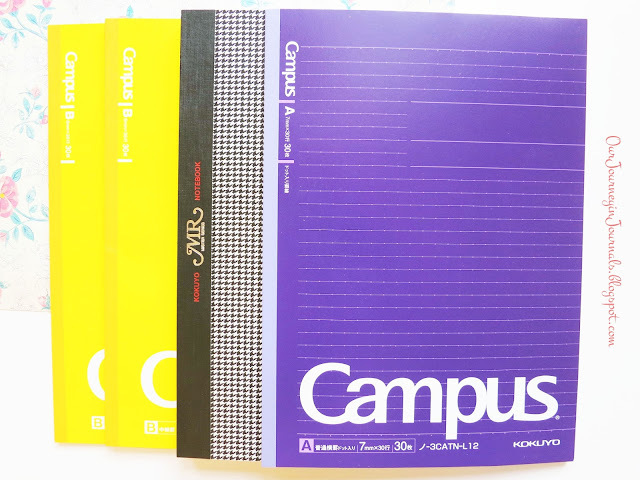 I bought three Kokuyo Campus notebooks since I've been wanting them for about a year now; they're supposed to be really good for school notes. They were $3.95 each, so $10.95 in total. All three of them have 30 sheets (or 60 pages), are B5-sized, and have lined pages. One of them (the purple one) is the "A" version with 7 mm ruling and kind of look like if you combined dot grid with normal lined paper, and two of them (the golden yellow ones) are the "B" version with 6 mm ruling. I plan to use the latter for next year's math class since orange is my color for math, but I don't know what I'm going to use the purple one for yet. I also got an additional Kokuyo notebook from the MR Master Series, which is the houndstooth one in the above picture, and though the sticker says $10.95, it actually rang up as $11.85. I can't find much information about it online, but I believe it's B5 and has 7 mm line spacing. The layout of each page is also the same as the Campus notebooks, though it has way more pages. I think there are about 100, 110 sheets? All of these Kokuyo notebooks are bound and are softcover. 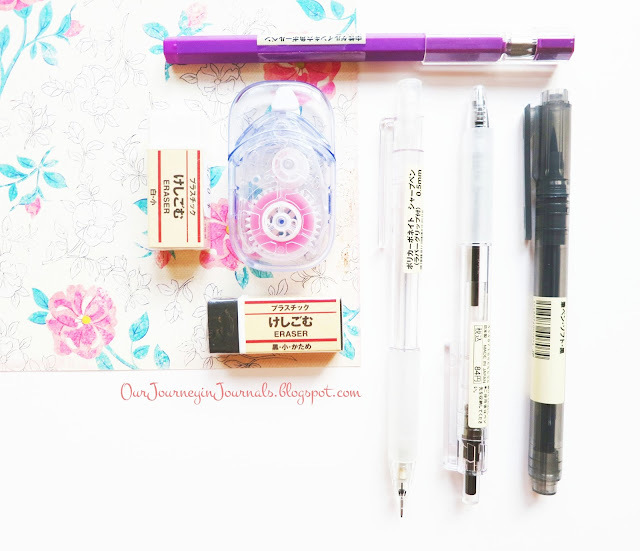 I got four pens at Kinokuniya: a 1.0 mm white Uni-ball Signo UM-153 gel pen ($2.95) since I've seen many people use it for highlights, a black 0.5 mm Zebra Sarasa Push Clip gel pen ($1.95) since I wanted to replace the one that I used up (and they didn't have any cartridges), a black Kuretake Zig Clean Color Real Brush Pen ($3.99) since I wanted to try it out for calligraphy, and a black Pentel Sign Pen. It was really sad because as I was unpacking all of my stuff after I got home, I realized that the Kuretake brush pen was uncapped! I didn't know how long it had been like that, but when I tried using it, it was super dry and streaky. I kind of revived it by dipping it in water, but of course, it's not nearly as pigmented as it used to be. Also, the Pentel Sign Pen I got at Kinokuniya is the hard tip version - and NOT the Fude Touch Sign Brush Pen that I wanted to get! This was super disappointing, but I've learned that the way you can tell them apart is that the hard tip Sign Pen is a plain glossy color, while the brush tip Fude Touch one looks almost glittery because it has light-colored speckles all over it. 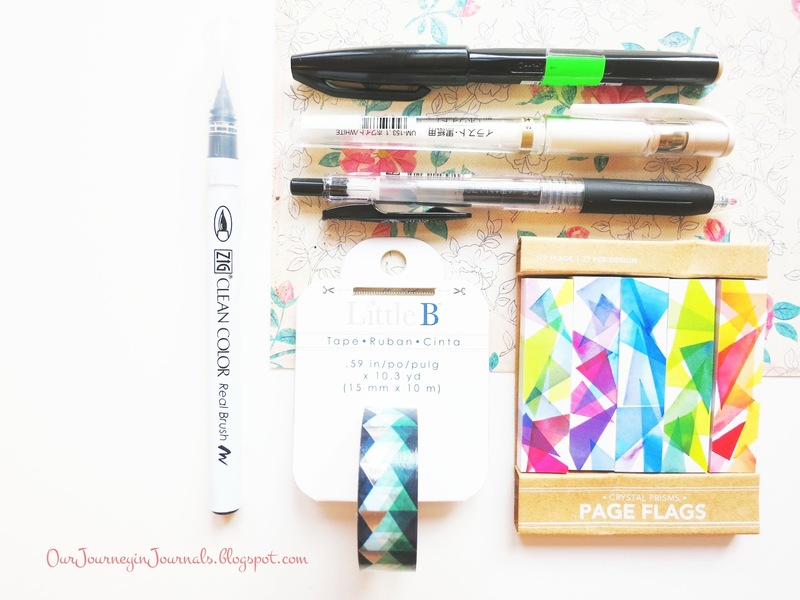 Furthermore, I bought a roll of really pretty geometric washi tape ($3.50) and a pack of page flags with a "crystal prism" design ($6.25); it comes with five different designs with 75 flags each, so 375 total. I hate how expensive individual rolls of washi tape usually are (and some sets, too), but this roll was just too cute to pass up. My purchase at Kinokuniya came to a total of $47.57, including tax. On Tuesday, I met up with one of my friends who is also a stationery lover and happened to be visiting NYC for a few days. We visited various shops in SoHo. The first store we went to was the Muji SoHo Pop-Up since the regular Muji store in SoHo was closed for renovation, and Muji is a fabulous place. Plus, I had only gone to one before (one in China). Anyway, though the SoHo Pop-Up's selection of products was significantly smaller than the regular Muji stores, I still managed to spend $56.67 (do you understand the subtitle of this post now?). Muji's products are known for having low prices, but it was one of those things where a bunch of little, low-cost items really added up. I got two A5 notebooks; one was a 5 mm graph notebook with 30 sheets/60 pages ($1.50), and the other was a 6 mm lined notebook with 72 sheets/144 pages ($4). 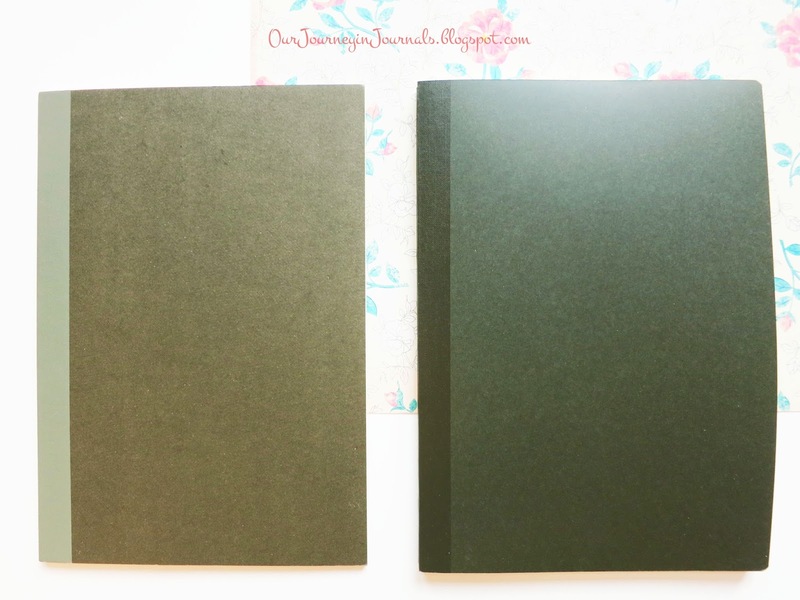 They're both bound, softcover notebooks, and you can easily write on the covers since they're not laminated or anything like that. I got a CRAP ton of writing utensils - mostly pens - from this Muji; the cashier had to bag the open stock ones into three separate envelopes. 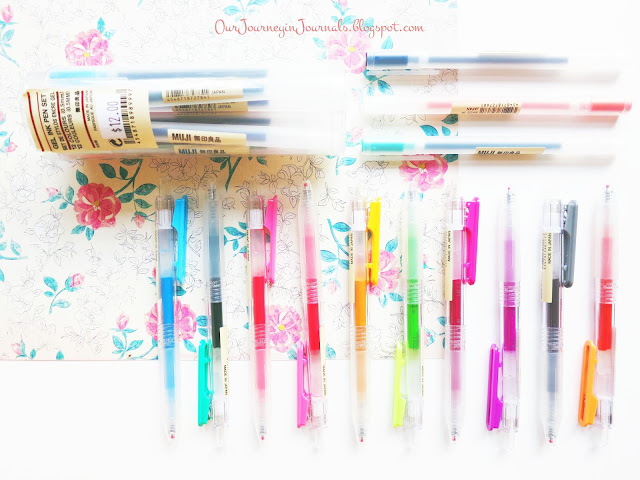 I got ten of the retractable 0.5 mm gel pens ($1.50 each/$15 total) - each one in a different color, except for one that I accidentally got a duplicate of. The colors I purchased are the light blue, green, pink (the one I got two of), yellow, yellow-green, red-violet, purple, gray, and orange pens; I got these names from the receipt. I also wanted to get a black one plus refills, but the pop-up location didn't carry any of the black ones :(. This was especially disappointing since that was one of the few things I came in knowing I wanted to get. I also got a 12 pack of the 0.5 mm capped gel pens ($12). I don't know the official color names, but they look like green, light green, orange, black, light blue, blue, dark blue, rose pink, normal pink, red, and light purple. In addition to this pack, I got a couple of open stock of these same gel pens but in the 0.38 mm size ($1.50 each/$4.50 total) in orange, blue-black, and green. 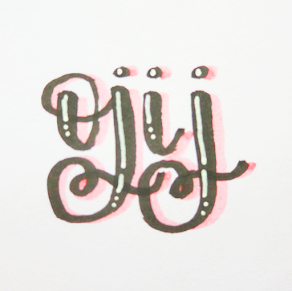 The rest of the writing utensils I bought from Muji SoHo Pop-Up are a gray brush pen with actual bristles ($3), which I actually thought was black until I got back home despite the fact that I even tried it in the store (that makes it sound like I'm bitter, but I swear I'm not lol), a 0.25 mm hexagonal gel pen in purple ($3), a black 0.7 mm retractable, polycarbonate ballpoint pen ($1.50), and a 0.5 mm polycarbonate mechanical pencil ($1.25). The last things from here are some miscellaneous items - 5 mm "glue tape" ($4.80) and two small plastic erasers, one white and one black, for $0.75 each ($1.50 total). The former works kind of like correction tape, except it puts down double-sided tape instead of white stuff. I intend to use it for permanently sticking down sticky notes or for low quality washi tape or something like that. The Paper Source in SoHo was the otheFr stationery store we went to that day. 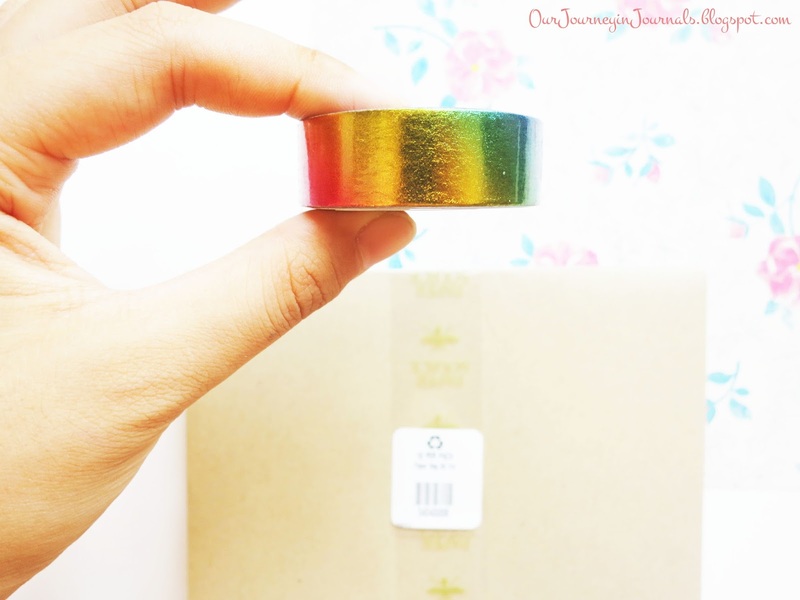 I only got two things: a 10 pack of A6 envelopes in the "paper bag" color ($4.50) and a roll of rainbow, gradient metallic foil washi tape from the brand Love My Tapes ($5.95). 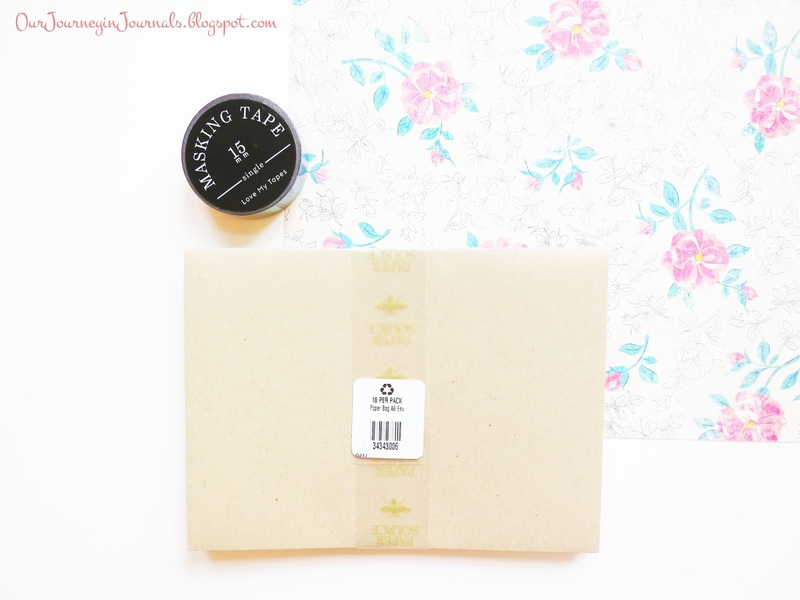 I got the envelopes because I want to send letters and stuff (like a lot of the people in the stationery and bujo community do), but that washi tape was so expensive!! I justified it because this tape is super cool-looking. My total came to $11.38, including tax. On Wednesday, I went to see the musical Waitress, but on the way my sister and I went to the Muji Times Square location. Since it was a "full out" store, it was a lot bigger than the SoHo Pop-Up. I got the black retractable 0.5 mm gel pen ($1.50) that I originally had wanted to get plus five refill ink cartridges for it, which were $1 each/$5 total. I also got a 3-pack of red patterned washi tape ($5.50), a pack of cat sticky notes with three different designs ($4.50), and a twin ring dot grid notebook with clear covers and a pocket in the front ($7). The pocket has a zip closure - or at least what I think is called a zip closure; I'm talking about this thing that you sometimes see on fancier Ziploc bags. The total here came to $25.29. 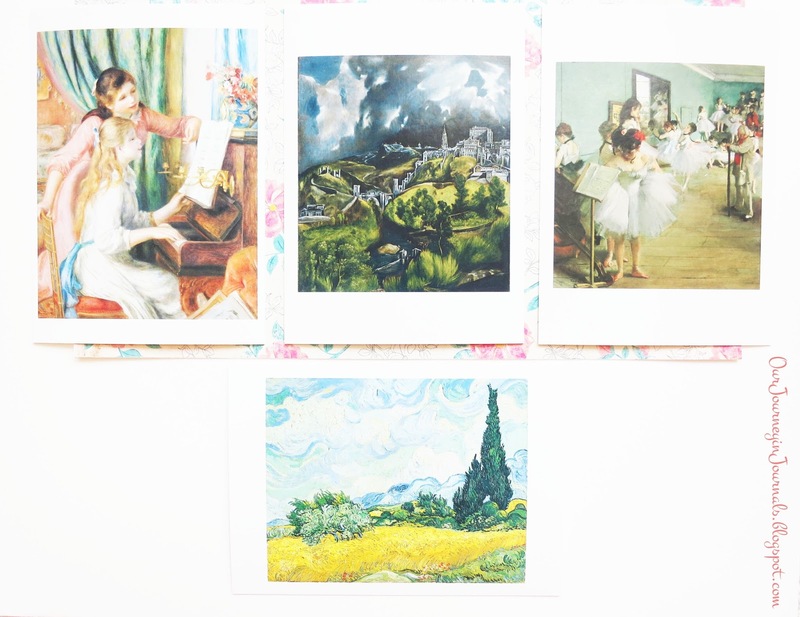 Along with a book, I purchased four postcards with various artworks that were in the museum, including pieces by El Greco, Renoir, Degas, and van Gogh. I'm not actually entirely sure if postcards count as stationery, but I think they are? They were $1.50 each, so it was $6.53 with tax. Apple Art is a small business in Brooklyn that sells art supplies (well, duh). I got an orange Pentel Fude Touch Brush Pen, a black Tombow Dual Brush Pen since my old one is getting frayed, a super light gray Tombow Dual Brush Pen (N95), a black Kuretake Zig Calligraphy Pen which is double-ended and has two different sized italic nibs, and a size 2 Princeton round watercolor brush from the Snap! range. My receipt doesn't say the individual prices for each item, and I don't remember any of them, but my purchase as a whole was $18.95. The other store I went to on Friday was Blick Art Materials in Brooklyn. 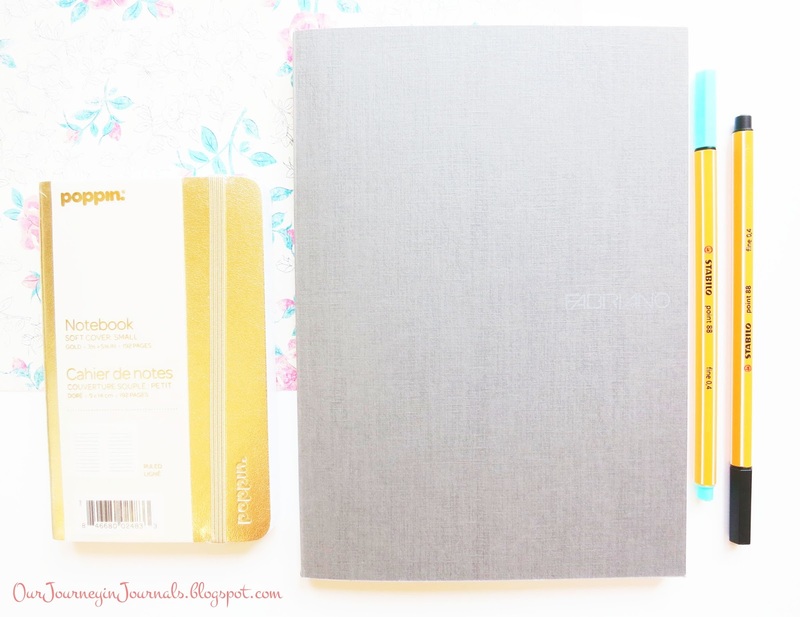 I bought two notebooks - a gray, A5 dot grid Fabriano notebook ($5.95) with 90 sheets/180 pages and 85 GSM paper and a softcover small, gold lined notebook ($5.95) that's a little smaller than A6 - and two Stabilo Point 88 Fineliners ($0.95), which have 0.4 mm tips, in the black and ice green colors. $15.07 was my total. 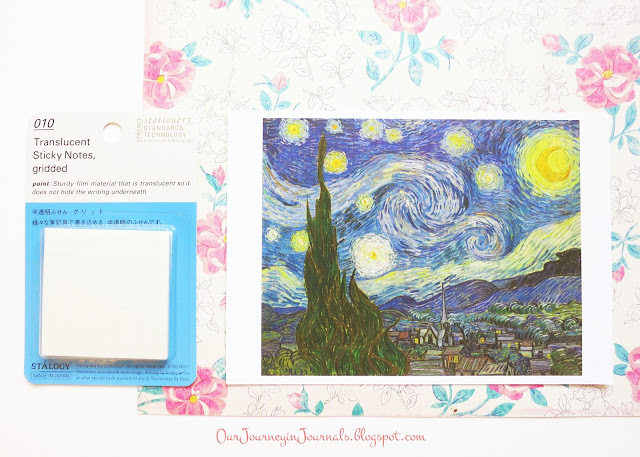 At the MoMA, I just got two stationery things: a postcard of Starry Night by van Gogh ($1.75) and clear grid sticky notes from Stálogy ($6.95). The latter was way more expensive than I would've liked, but I had also been wanting to get translucent sticky notes for over a year. With tax, that meant that I spent $9.44 on stationery at the MoMA gift shop. Okay, I first gotta say that this Michael's was a little magical because it was TWO FLOORS!!! What??? It was crazy. (Yup, as you can tell, I'm a very cool teenager). Anyway, I got a set of three rolls of red patterned washi tape from Recollections ($4.99), a pack of pretty sticky flags ($2.99) also from Recollections with five different designs and 125 flags in total, a set of eight Recollections marbled washi tape ($10), a black Pentel Fude Touch Brush Sign Pen ($3.39) that was actually a brush pen, and the Artist's Loft Fundamentals Pearlescent Watercolor Pan Set ($5), which comes with 28 colors and a paintbrush. 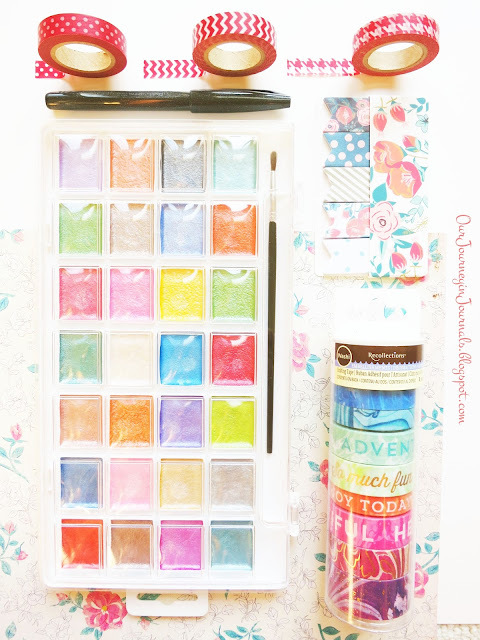 I swatched all of the colors in my bullet journal, and they are super pretty! All of this stuff came to $28.71. Also, pro tip: Recollections is an in-house brand at Michael's, so their washi tape tends to be a lot cheaper than most other places and brands. 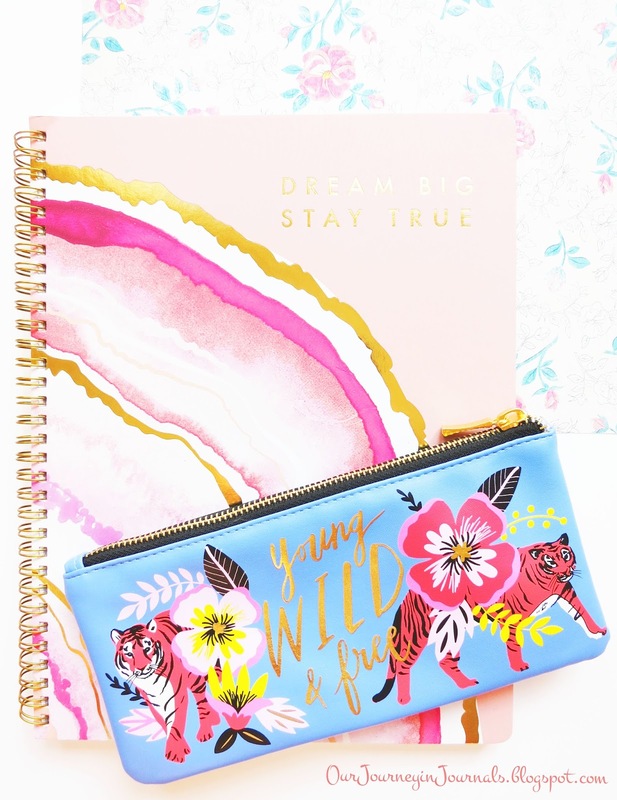 At this Paper Source, I only got two things since Paper Source tends to be pretty pricey - a really pretty lined notebook ($12.95) that's about A4 sized, has 99 sheets (I think), and is three subject and a super cute tiger pencil case ($7.24) that I got on clearance, so it was 20% off of 30% off of the original price of $12.95. $21.98 ended up being my total. Pro-tip: if you're reading this post soon after it was published, definitely go to Paper Source because they have a crap ton of stuff on clearance! This was the very last store that I went to, and I visited it the morning before when my flight was supposed to be. 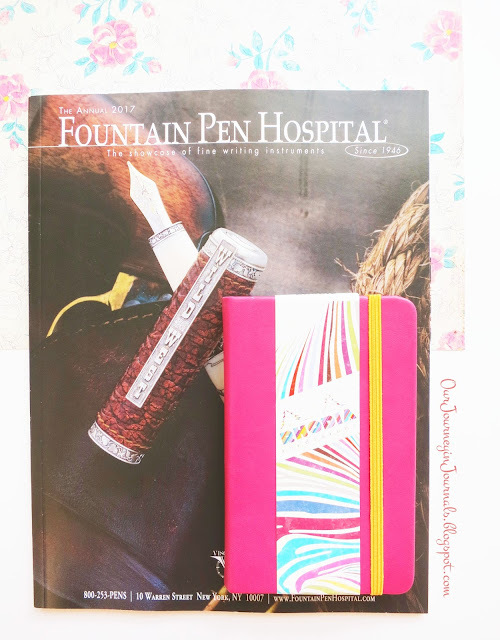 It was a fountain pen and luxury stationery haven. Though the name of the store makes it sounds like it's a fountain pen repair place, I believe that the shop is the main thing of the business. There were both new and vintage fountain pens, and there was so much stuff that I wanted to buy, but alas, I only have so much money. I especially wanted to get the Lamy LX fountain pen in rose gold since I've been wanting it ever since I saw it. However, I ended up just getting a small raspberry Rhodiarama ($13.95) that's about A6-sized. The paper is ruled and 90 GSM, and there are 192 pages. It was $15.18 with tax. So, these are my overall thoughts on all of the stationery and art supply stores that I went to when I was in New York City. Of course, I'm not including the museum gift shops that I purchased from. Dang, this is the longest post I've ever written at over 3000 words! Just in case you're wondering, I saw two shows: Waitress (a musical on Broadway) and Puffs (an absolutely hilarious Off-Broadway play that I really recommend for any Harry Potter fans out there that don't like raunchy humor). Fun fact: I originally thought I had spent close to $400 on this entire haul, and I was so strangely relieved to know that it was an entire hundred dollars less. 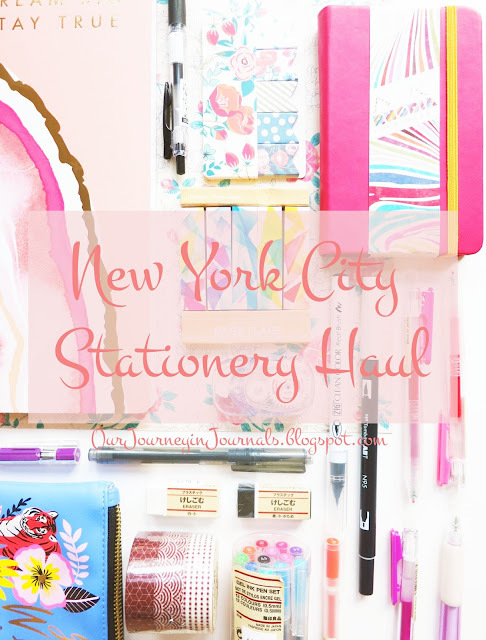 Anyway, I hope you enjoyed seeing all of the stationery I bought while I was in New York City! Are you like me, or are you a responsible spender? Make sure to let all of us know in a comment!